The stuffing can be as easy as seasoned breadcrumbs, or if you want something a little fancier, try couscous, sausage or seafood. 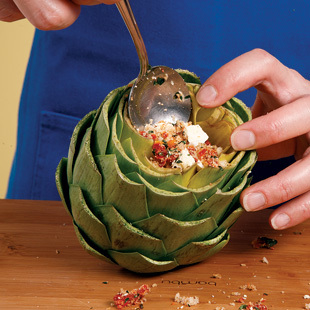 Just keep in mind that you’ll need about 1 cup of stuffing per artichoke. Be prepared to give a little coaching on how to eat them. Just pick off each leaf and scrape the base of it with your teeth. You’ll get a taste of stuffing and the little fleshy bit from the bottom of the leaf. Once you work your way through the outer leaves you’ll get to the more tender and more edible inner leaves. 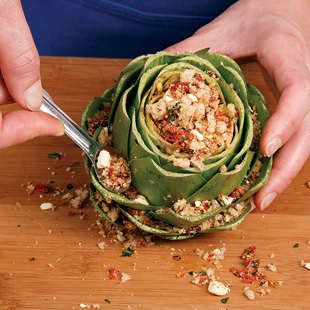 Keep going and you’ll get to the artichoke bottom filled with the jackpot of stuffing. Use a knife and fork for this part. And enjoy! 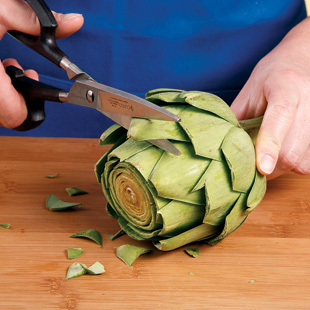 Cut off the top 1 inch of leaves from an artichoke. Remove the outer layer of small, tough leaves from the stem end. Snip all remaining spiky tips from the outer leaves. Cut off the stem to make a flat bottom. (Discard the stem.) 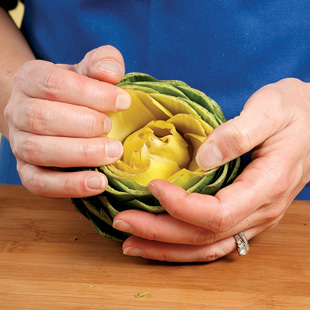 Starting at the outer layers and progressing inward, pull the leaves apart to loosen. Pull open the leaves at the center until you see the spiky, lighter leaves around the heart. Pull out those lighter leaves to expose the fuzzy choke. Scoop out the choke with a melon baller or grapefruit spoon and discard. 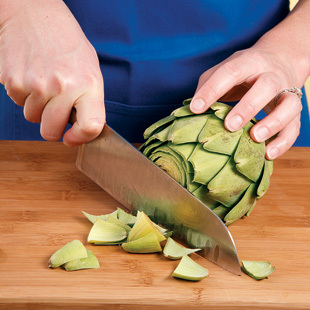 Repeat this step with the remaining artichokes. 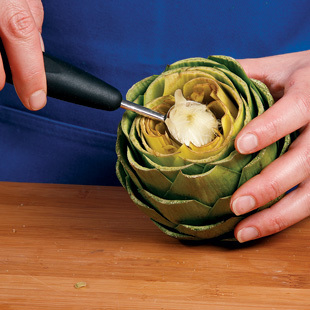 Spoon 1/2 cup stuffing into the center of an artichoke. Stuff an additional 1/2 cup stuffing between the outer leaves, toward the base, using a small spoon. Repeat with the remaining artichokes and stuffing. Flavorful sun-dried tomatoes and tangy feta add depth to the stuffing for these artichokes. Here a simple bread filling is accented with anchovies, and the lovely flavor permeates artichokes while they steam.